1940 Gum Inc. Superman is one of the most popular trading card sets of all-time. The set holds the distinction of being the first in a long line of releases based on the Man of Steel. It's also considered to be the most valuable. 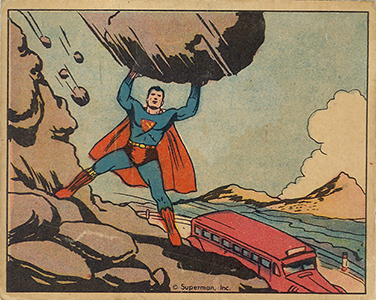 The 1940 Gum Inc. Superman checklist consists of 72 cards. While all are relatively scarce, the final 24 (#49-72) are considered short prints. As such, they can carry a premium over the more common low numbers. 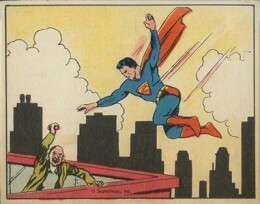 Card fronts feature vivid artwork, usually with Superman saving the day. Backs have a lengthy writeup hyping what's on the front and building up the hero. The bottom of the card has a Superman logo and an ad. 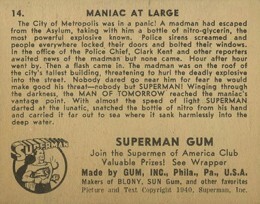 Today, 1940 Gum Inc. Superman cards sell for solid amounts, no matter the condition. They're attractive and they're Superman's first foray into the hobby. In short, it's a piece of pop culture history. I have inherited 2 sets of 1940 vintage non-sport card sets and I want to find the best way to sell them- either Ebay or by way of a large auction house. They have not been graded by PSA yet. set of 47 cards (#2 to #48). I feel that are in a 5 to 6 PSA grading. The second set is a very rare set of 24 cards of the First Column Defender cards. They also are in the range of a 5.5 to 6.5 PSA grading. I have not seen or heard much about this set, and I have been looking. I did compare my cards with the number 3 PSA registry set for the PSA registry and I frrl my cards would grade better than those cards. Do you have any suggestions on how I should proceed to sell these 2 fine sets? rick vesler � Your best bet would likely be to have them graded first, probably start with PSA as they’re held in high regard for non-sport. From there, probably check with an auction house to see what sort of terms they offer or even consign with a large eBay seller. About a year ago I ran across a 1940 Lone Ranger o-pee-chee card from Canada and I haven’t seen any since so I was wondering if there are Lone Ranger 1940 gum cards from Canada could there be 1940 superman gum cards from Canada too? If you have any information about this I’d greatly appreciate it. Are there reproduction cards of the 1966 Topps Superman trading cards?